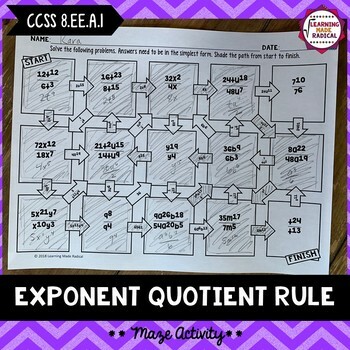 Practice solving Exponent Quotient Rule problems with this fun maze activity. Students will work on solving exponent quotient rule problems, only! They must complete the problems correctly or it could take them a wrong way through the maze. 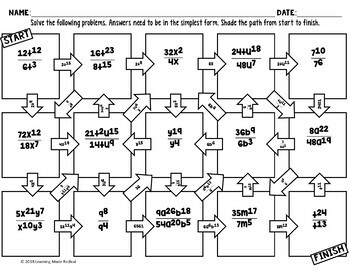 This activity can be used by completing the 13 maze problems only or have students complete all 15 problems for practice. More resources that are included in Part 2 of the Exponent Rule Bundle! Here are MORE resources that are included in Part 1 of the Exponent Rule Bundle! OR find Part 1 AND 2 in this bundle here; Exponent Rule Part 1 and 2 Bundle!